Free Shipping Included! 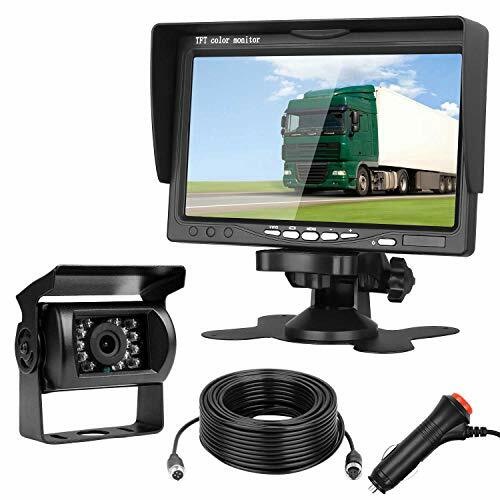 Emmako Backup Camera and 7'' Monitor Kit For RV/Truck/Trailer/SUV/Bus/Pickup IP68 Waterproof Night Vision Camera Guide Lines ON/Off With Single Power Rear/Front View System Reversing/Driving Use by Emmako at Nebula Fia. MPN: 43181-330100. Hurry! Limited time offer. Offer valid only while supplies last. Emmako Backup Camera and 7 Display Monitor System Features: 1. Helpful video on YouTube,video id is Hw5EFfheObY , search this id on YouTube found it. 1. Helpful video on YouTube,video id is Hw5EFfheObY , search this id on YouTube found it. Any one can install it by know how to wire to reverse lights or running lights. 2.Upgraded camera without color difference, viewing the trees/grass is exactly green. 3.It can on/off guide lines, switched from mirrored pictures(rear view) to normal (front) via monitor button. 4. 66ft 4-Pin cable with extremely durable and waterproof Dealing with extreme weather. 5.Can add a additional front/side/rear view camera to current system. (Monitor with two way video inputs). 6，The monitor screen was set default start up/off auto when power come on/off,So We provided a lighter adapter with on/off switch to control the monitor. 7, The system can be set up to work in any time in driving/reversing/parking by your control. 8，The camera angle of view can be adjusted up and down. 9, Monitor has removable bracket with foam adhesive for convenient mounting on flat surface. Bracket can be removed for custom installation.if you want a suction cup mount for fix on windshield,Just contact us get it. View installation video: https://youtu.be/Hw5EFfheObY, The reverse camera system be powered by directly connecting to a 12V-24V source cigarette lighter/fuse box/power point/ignition switch for continuous use or reversing rear view use.There is a ON/OFF switch easily be control by you. IP68 waterproof camera with 150 degree viewing angle and 18 LED lights. Camera is connected to monitor via direct 66ft 4-Pin cable (provided). IR Night Vision view clearly at night .And what is more attractive is No color difference. Other ordinary cameras always view trees/grasses are red or purple. The upgraded rear view camera views exactly green. Via the monitor button switched from mirrored pictures(rear view) to normal (front). And guide lines on/off via menu button. Monitor has capability to monitor two video inputs V1/V2. V2 video input will have priority (reverse camera) for safety by connecting blue wire to power positive or you need switch between V1 and V2 by manual. If you have any questions about this product by Emmako, contact us by completing and submitting the form below. If you are looking for a specif part number, please include it with your message.